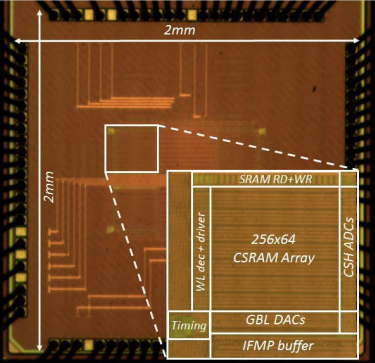 This paper presents an energy-efficient static random access memory (SRAM) with embedded dot-product computation capability, for binary-weight convolutional neural networks. A 10T bit-cell-based SRAM array is used to store the 1-b filter weights. The array implements dot-product as a weighted average of the bitline voltages, which are proportional to the digital input values. Local integrating analog-to-digital converters compute the digital convolution outputs, corresponding to each filter. We have successfully demonstrated functionality (>98% accuracy) with the 10,000 test images in the MNIST hand-written digit recognition data set, using 6-b inputs/outputs. Compared to conventional full-digital implementations using small bitwidths, we achieve similar or better energy efficiency, by reducing data transfer, due to the highly parallel in-memory analog computations.